The Trafsys Beams are easy to setup and maintain. They can communicate wirelessly to a MIU-1000 through a 4.9 repeater interface. Each beam set is identified by a unique serial number, which is embedded in every data packet sent to the MIU-1000. 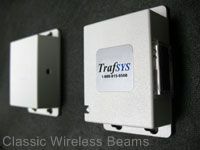 This manual shows you how to use the Traf-Sys Wireless Beams.